We already have the tool path and material. We can run a simulation. We have several types of simulations. For now, we will focus on two of them. The first one is called Simulation, and the other is Solid Simulation. We can run the simulation in several different ways. The first of them is from the View tab, we choose the appropriate type of simulation. The second way is to run the simulation from the Simulation tab in the Project Manager. 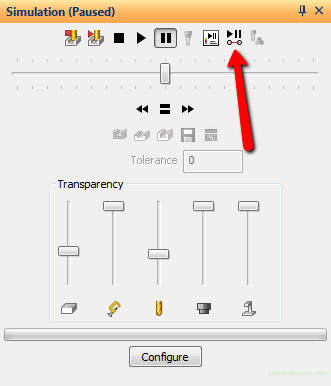 The third way is to right-click in the work area and select the appropriate option from the circular menu. The first option at the top is Simulation, and the next option (highlighted in the figure above) is Solid Simulation. At the beginning, choose the Simulation option. In the Project Manager, the Simulation tab has been automatically opened. To start the simulation, click the Start Simulation button. As you can see in this simulation mode, we only see the model of the tool “drawing” the tool path. You can not see the material being removed here. It would seem that this simulation mode is useless. But this mode has a great advantage when analysis the machining. The tool is visible and the geometry to be machined is visible. By running a simulation, e.g. step by step, we can quite accurately observe the position of the tool at a specific moment. 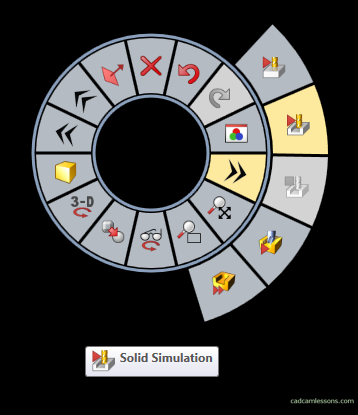 To run the simulation step by step, select the Single Step mode. On the left side of this button (seventh button) is the Operation by Operation. It is a simulation mode in which after each operation the simulation will be stopped until the Start Simulation button is pressed again. A useful mode in the machining analysis. In addition to the advantages mentioned above, this simulation mode has one more plus. Is very fast. And for an experienced programmer, often the shape of tool paths, in relation to geometry, are sufficient information. The next type of simulation is Solid Simulation. Choose this type (e.g. from the circular menu). Now, after running the simulation, we see how the material is removed. 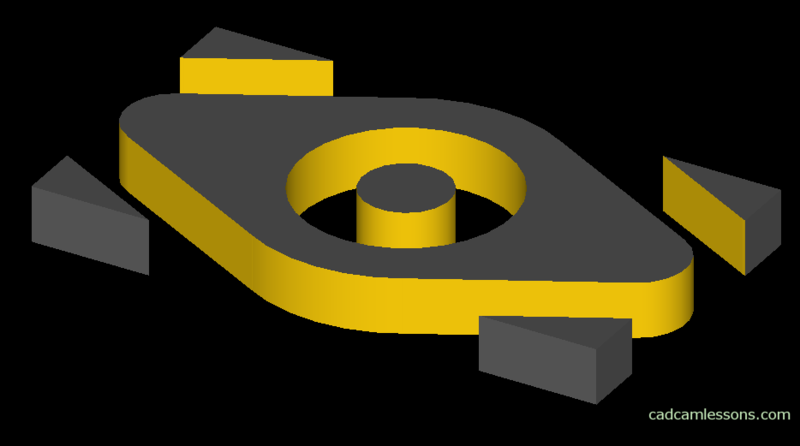 This simulation will show us the final result of the machining, which gives an idea of what the part will look like after machining. At this point, it is worth mentioning several functions available in the simulation. 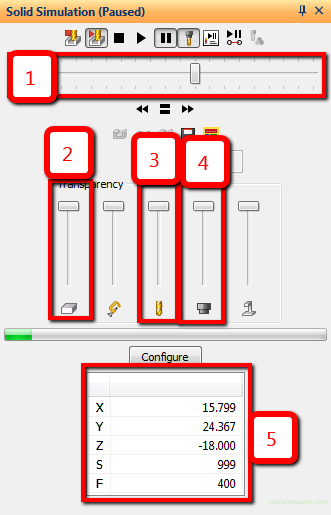 You can control the speed of the simulation using the Speed slider (1). The slider (2) is responsible for the stock transparency. We can hide it a little to have a better image of tool paths or the tool itself. 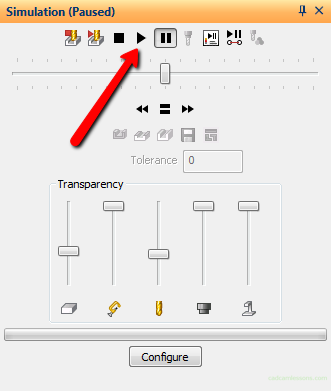 The slider (3) is responsible for the tool transparency, and the slider (4) is responsible for the holder transparency. The table (5) shows the coordinates and feedrate and spindle revolution value at a specific machining point. Works when you press the Pause button or in the Single Step mode. Useful for detailed machining analysis. We will regularly come back to simulation to view the results of our work.